Womens Health Foundation, 9780996535809, 212pp. When was the last time anyone talked to you about going to the bathroom? Probably not since you were potty trained Did you know there are exercises that improve sports performance as they improve pelvic health? And, have you or your daughter every wanted to curl into a ball and stay home from school or work while you have your period? 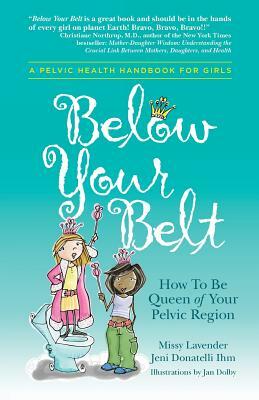 More than a book about first periods and changing bodies, Below Your Belt is a pelvic health handbook to teach women and girls about the WHOLE picture - about the other things going on "down there" in addition to menstruation. BYB helps girls be strong from the inside out, as they participate in sports; establish habits surrounding bathroom behaviors, hygiene, and nutrition; and head into young adulthood and beyond with a new understanding and connection to their pelvic region. Why is this so important? All of these questions address ever-increasing pelvic healthcare costs in the U.S., where nearly $66 billion is spent on incontinence products and treatment alone. Studies have shown that millions of girls already experience symptoms around compromised pelvic health including frequent urinary tract infections and constipation. These symptoms alone can follow girls into adulthood, creating both physical and social discomfort. Taking readers on a journey through their pelvic region will shine light on each part including bones and muscles, bladder and bowel health, ovulation and periods, core energizing stretches and exercises, hygiene, and more. In addition to the engaging and humorous text, Below Your Belt includes proper terminology, illustrations and diagrams, a "texting Lexicon," Glossary, Conversation Starters and many other websites, products, and additional resources. For girls ages 10-14, parents, caregivers, educators and healthcare providers.